Lawrence Timmons. who signed with the Miami Dolphins as a free agent this past offseason, went AWOL Saturday, the day before their season opener at the Los Angeles Chargers. DAVIE, Fla. (AP) — Miami Dolphins coach Adam Gase is declining to discuss linebacker Lawrence Timmons’ future with the team, which may be brief. Timmons went AWOL Saturday, the day before the Dolphins’ season opener at the Los Angeles Chargers. The Dolphins filed a missing person report before making contact with Timmons, who apparently was dealing with a personal matter. He wasn’t with the Dolphins at the game and didn’t fly back to South Florida on the team plane after Miami’s 19-17 win. While Timmons wants to rejoin the team, it’s unclear whether that will happen. Gase said Monday he hadn’t talked with Timmons about the brief but untimely disappearance, and didn’t know whether the 11th-year veteran had returned to the team complex. “I’m kind of dealing with the guys that played,” Gase said. Gase declined to say whether Timmons might play Sunday at the New York Jets, or whether he expects the linebacker to return at all. A suspension also is a possibility. Gase did say his only rules for players are to be on time and play hard. His tolerance for a violation of those rules? 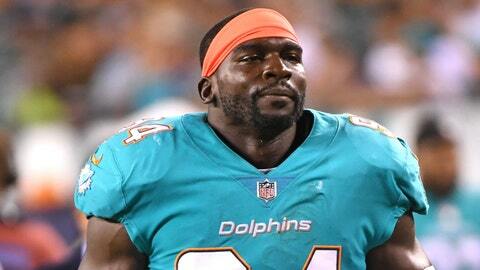 Without Timmons, the Dolphins had only four linebackers active against the Chargers. Undrafted rookie free agent Chase Allen started in Timmons’ place and made three tackles. Middle linebacker Mike Hull, making his second career start, played every snap and led Miami with 10 tackles. Gase said the linebackers did a “pretty good job,” but their use may change going forward — depending on the Timmons situation. Timmons signed a $12 million, two-year deal with Miami in March after 10 seasons with Pittsburgh, where he won a Super Bowl ring in 2009 and made the Pro Bowl in 2014. Miami’s scheduled opener on Sept. 10 was postponed because of Hurricane Irma. With the Dolphins given several days off that week, Timmons spent time with former Steelers teammates on their practice field and in the locker room on Sept. 8 before their first game. “He has been a team leader, always uplifting and bringing other guys along,” safety Michael Thomas said. Several players said they hadn’t talked with Timmons or seen him since team meetings Saturday. “You never know what’s going on with people’s personal lives,” Hull said.